The circulation well west of Mexico is rapidly developing and certainly is a depression at this time. Tropical storm status is probable for later today. 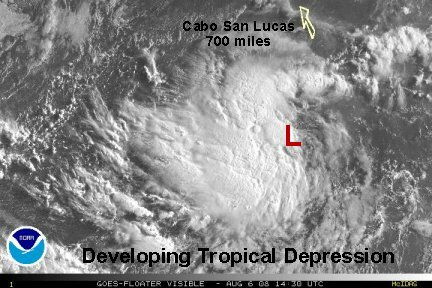 It is centered a little less than 700 miles south of Cabo San Lucas and is moving west away from Mexico. Conditions look favorable for development. It looks to be over warm water for awhile and has a good chance to become a hurricane in the next couple of days. This tropical cyclone will <b>not</b> be a threat to Mexico. Last edited by Caribbean Traveler on Thu Aug 07, 2008 12:52 am, edited 1 time in total. 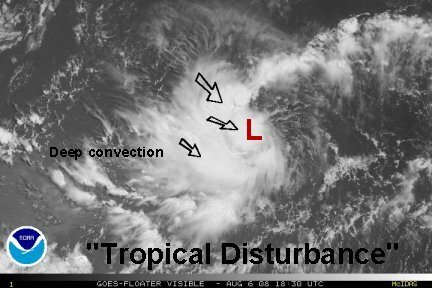 The "disturbance" is getting better organized and the center of circulation is now under deep convection instead of being on the edge of it. We believe that NHC will need to go to tropical storm status right away on their next advisory later this afternoon. If this system was in the Gulf of Mexico warnings would already have been posted. This tropical cyclone will not be a threat to Mexico. 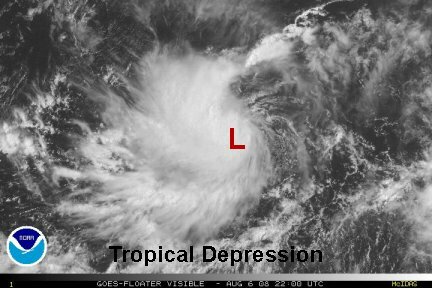 The "disturbance" was upgraded to tropical depression 9E last advisory. 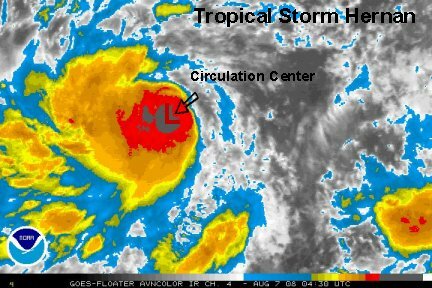 The depression was upgraded to tropical storm Hernan on the 8 pm pdt advisory. Top sustained winds 40 mph. We believe that the top winds are probably closer to 55-60 mph with a very deep burst of convection. Microwave wind estimates are 45-50 knots a little while ago. No doubt, NHC is low on this one. 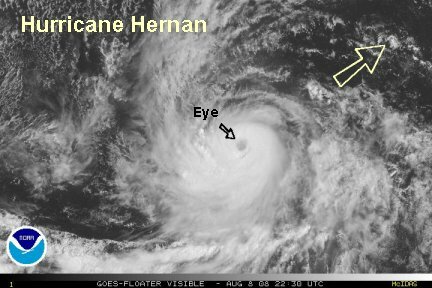 It's possible at this rate that Hernan will become a hurricane by later today or this evening. 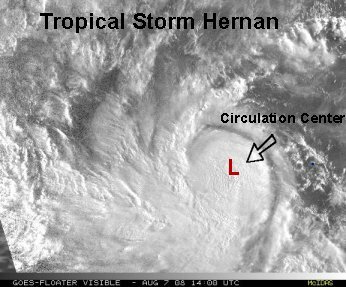 Hernan is centered near 13.6 N / 113.6 W or about 675 miles south-southeast of Cabo San Lucas. This tropical cyclone will <b>not</b> be a threat to Mexico. ....sort of. NHC brought the winds quickly from 40 to 50 to 60 since last night. Per our last update, we said that Hernan was already nearly this strong. Hernan continues to strengthen a little since our last update and our estimate of top sustained winds is 65 mph. So, NHC is now getting close to our estimate. Hernan is centered about 655 miles south-southwest of Cabo San Lucas. It remains no threat to Mexico. Swell may increase over toward the Baja as the storm strengthens. Our latest estimate is 65-70 mph. Water vapor imagery suggests the formation of an eye wall is taking place to we are getting close to 74 mph. 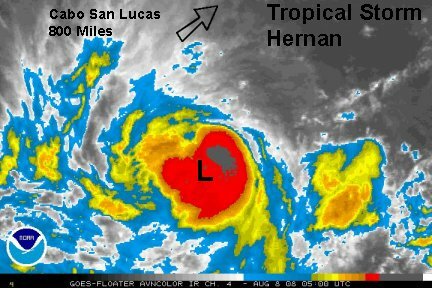 Hernan is centered near 14.5 N / 117.0 W or about 730 miles southwest of Cabo San Lucas. Hernan is not a threat to Mexico. Last edited by Caribbean Traveler on Fri Aug 08, 2008 12:58 am, edited 1 time in total. Our latest estimate is 70 mph. Deep convection is expanding and we expect Hernan to reach hurricane strength soon. 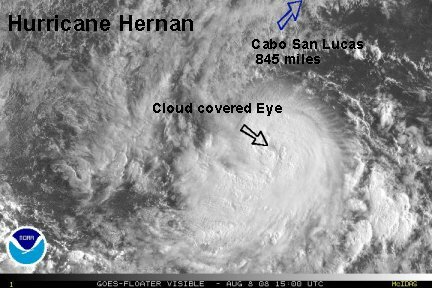 Hernan is centered near 14.6 N / 118.7 W or about 800 miles southwest of Cabo San Lucas. Hernan is not a threat to Mexico. AT 9 am pdt (12 pm edt) Hernan is centered near 14.9 N / 120 W or about 845 miles southwest of Cabo San Lucas. An eye has appeared but is covered with high clouds. The I.R. satellite imagery shows the eye clearly. With the eye now formed, our estimate of top sustained winds is 80 mph. Hernan is still strengthening and will likely to do so for another 12-24 hours. At that point Hernan will move over cooler waters, starting the process of weakening. 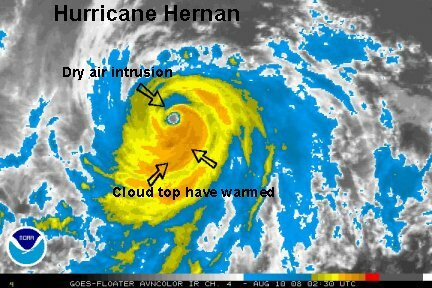 The latest satellite imagery shows a much stronger Hernan. Officially Hernan is at 85 mph. Our estimate is 90-100 mph. The eastern side of the hurricane has very deep convection. Of course, no recon data is available and at this point no recent microwave satellite estimates either. Hernan is centered near 14.9 N / 121.0 W or about 900 miles southwest of Cabo San Lucas. Movement is slower, west at around 9 mph. Slow weakening will kick in by tomorrow as it moves over cooler water. The satellite presentation is not as good as several hours ago. NHC's last update (5 am edt) had 100 mph. Winds have increased since then and were probably near 115 mph a few hours ago, but now looks a bit weaker. Hernan now is moving northwest. This will seal Hernan's fate as it is heading toward cooler water. The strength should be coming down be later today. Hernan is no threat to land. Hernan is centered near 15.7 N / 123 W or about 980 miles west southwest of Cabo San Lucas. NHC's just updated Hernan to 120 mph. We think this is a little high. It looked like Hernan maxed out a couple of hours ago. The microwave estimate was 117 knots several hours ago. There isn't much difference between an estimate of 115 or 120 mph. Either way, weakening should start later today. Hernan is still very strong.....120 mph. Hernan is still maxing out. 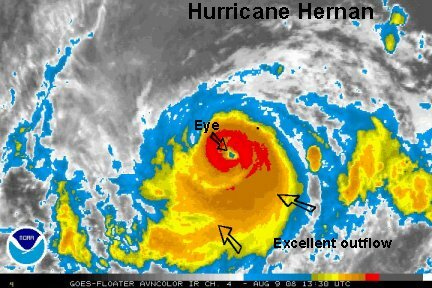 After our estimate of 115 earlier, it looks like Hernan has not decided to weaken quite yet. NHC top sustained winds at the latest advisory are 120 mph. The eye has decreased in size just a bit today, and convection remains very strong on the southeast side of the tropical cyclone. With that being said, 120 mph looks good to us too. A bit of dry air is on the northern side of the circulation and would weaken Hernan considerably if any makes it into the eyewall circulation. We are still expecting weakening. Hernan is moving just a little south of northwest at around 10 mph and poses no threat to Mexico. 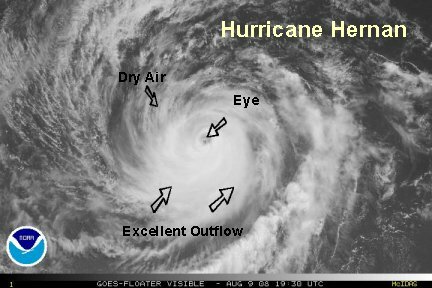 Hernan has started its weakening as dry air is now affecting the northern portion of the eye wall. Cloud tops have also warmed, a sign of weakening also. A microwave satellite estimate of 107 knots was made about three hours ago. With that being the case, we are now estimating top sustained winds of 110 mph. It usually takes some time for the winds to spin down. The eye is still smalll. 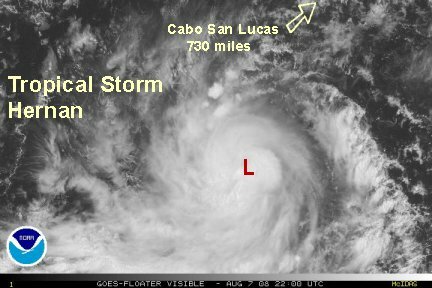 At 11 pm edt (8 pm pdt) Hernan was centered near 16.7 N / 124.9 W or about 1065 miles west southwest of Cabo. Since Hernan is now weakening and it poses no threat to Mexico, this will be our last update unless it becomes a threat to Hawaii.